Power Core Aeration is one of the most important cultural pro-actives available for your lawn. Aeration helps control thatch, improves the soil structure, helps create growth pockets for new roots, and opens the way for water and fertilizer to reach the root zone of your lawn. Annual or semi-annual aeration is advised for all lawns on heave clay soils, those with a thatch buildup, and any lawn that needs to be "thickened up." Aeration removes thousands of small cores of soil 1" to 3" in length from your lawn. These cores "melt" back into the lawn after a few rainfalls, mixing with whatever thatch exists on your lawn. the holes created by aeration catch fertilizer and water. 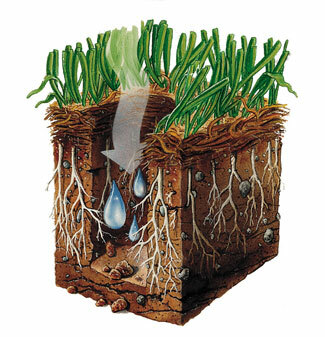 Turf roots naturally grow toward these growth pockets and thicken in the process. Aeration holes also relieve pressure from compacted soils, letting oxygen and water move more freely into the root zone. Thatch on your lawn works like a thatch roof. this layer of roots, stems and other plant parts sheds water and prevents fertilizers and insect controls from moving freely into the soil. Thatch that is too heavy can make major lawn renovation necessary. Regular aeration helps thatch break down naturally by mixing the soil cores into the thatch and speeding up decomposition. Performed once or twice per year, aeration significantly reduces thatch and improves turf growth.